• Sharpening Capability of High-lowTeeth. • It is adjusted by a control dial the teeth high-low difference.The C type teeth with high-low difference could be ground out the same time. • The transmission molor could be changed from 4P into 8P freely by the variable speed switch.The maximum of 4P grinding speed is 180 teeth and the minimum of 8P grinding speed is 45 teeth. • It uses the stepless change pulley, therefore, the grinding speed could be adjusted following the changes of the teeth pitch per your need. 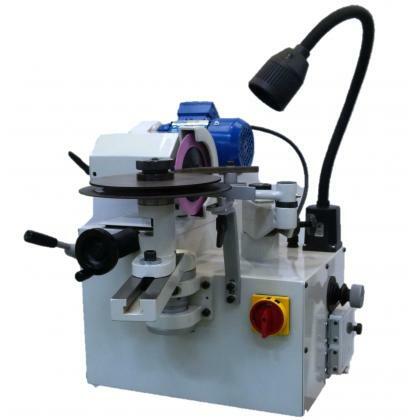 • This machine is well-designed for years and it is a professional class sawblade sharpening machine. 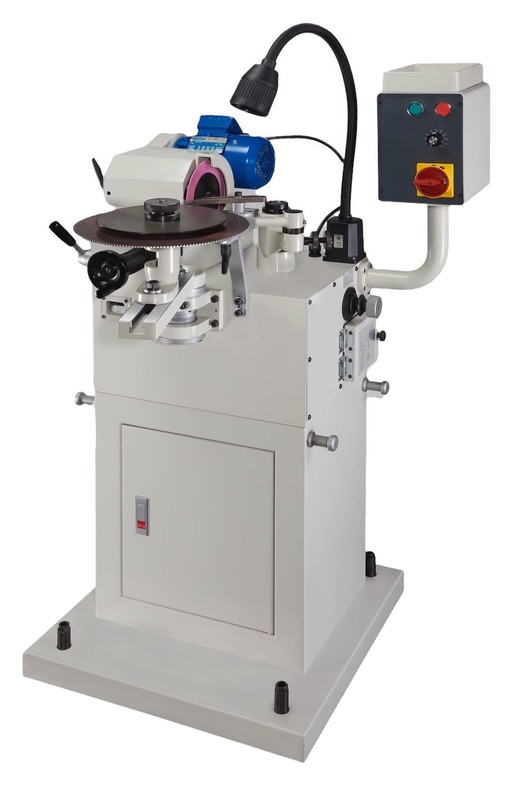 • Bran-new design; this sharpening machine is designed in the operator's position. All of the adjusting levers are arranged reasonably. In this way, the operator could adjust the cutting angle, the back clearance angle, the teeth depth and teeth pitch of the sawblade easily. 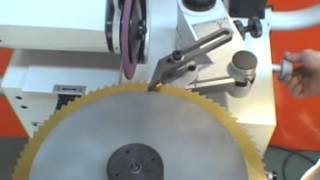 Therefore, the edgy sawblade could be ground out rapidly and precisely. • Through an accurate calculated mimic process of the computer, the industrial class and professional tooth shape cam could be designed. In this way, it would makd your grilnding of the sawblade more simple,more fast and more accurate. • The grinding head could do an up-and-down sawing, therefore, the chamfer angle could be ground out without changing the cam. • The tungsten carbide tipped pushing jaw provides maximum wear resistance to achieve the accurate feeding. • Applying the ball black lead cast iron (FCD-45) to all the cast irons In thismachine.Also, I tempered processis accomplished to ensure the accuracy and to increase the wear resistance. • All of the main parts uses SKD II high carbide steel.Also, the grinding and the heat treatment process are accomplished. • The push arm spring is reformed . 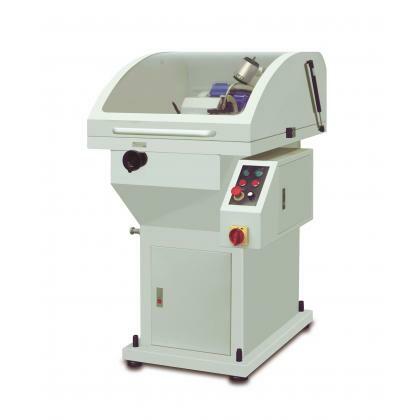 It uses rotary spring to avoid the elastic deformation of the spring and to ensurethe precision of the feeding. • Apply the high tensile alloy brass to the support of the sawblade feeding shaft and insert the high-tech-made concrete lubricant into it. It's specialty of high load carrying capacity and well wear-resistance could accomplish the oil-less feed function totally. • Using the feeding shaft.in 30mm. The spindle is enlarged and the heat treatment process are accomplished .